The papaya (/pəˈpaɪə/, US: /pəˈpɑːjə/) (from Carib via Spanish), papaw (/pəˈpɔː/) or pawpaw (/ˈpɔːpɔː/) is the plant Carica papaya, one of the 22 accepted species in the genus Carica of the family Caricaceae. Its origin is in the tropics of the Americas, perhaps from southern Mexico and neighboring Central America. The papaya is a small, sparsely branched tree, usually with a single stem growing from 5 to 10 m (16 to 33 ft) tall, with spirally arranged leaves confined to the top of the trunk. The lower trunk is conspicuously scarred where leaves and fruit were borne. The leaves are large, 50–70 cm (20–28 in) in diameter, deeply palmately lobed, with seven lobes. All parts of the plant contain latex in articulated laticifers. Papayas are dioecious. The flowers are 5-parted and highly dimorphic, the male flowers with the stamens fused to the petals. The female flowers have a superior ovary and five contorted petals loosely connected at the base. :235 Male and female flowers are borne in the leaf axils, the males in multiflowered dichasia, the female flowers is few-flowered dichasia. The flowers are sweet-scented, open at night and are moth-pollinated. The fruit is a large berry about 15–45 cm (5.9–17.7 in) long and 10–30 cm (3.9–11.8 in) in diameter. :88 It is ripe when it feels soft (as soft as a ripe avocado or a bit softer) and its skin has attained an amber to orange hue. Native to Mexico and northern South America, papaya has become naturalized throughout the Caribbean Islands, Florida, Texas, California, Hawaii, and other tropical and subtropical regions of the world. Papaya plants grow in three sexes: male, female, and hermaphrodite. The male produces only pollen, never fruit. The female produces small, inedible fruits unless pollinated. The hermaphrodite can self-pollinate since its flowers contain both male stamens and female ovaries. Almost all commercial papaya orchards contain only hermaphrodites. Originally from southern Mexico (particularly Chiapas and Veracruz), Central America, and northern South America, the papaya is now cultivated in most tropical countries. In cultivation, it grows rapidly, fruiting within 3 years. It is, however, highly frost-sensitive, limiting its production to tropical climates. Temperatures below −2 °C (29 °F) are greatly harmful if not fatal. In Florida, California, and Texas, growth is generally limited to southern parts of the states. It prefers sandy, well-drained soil, as standing water will kill the plant within 24 hours. Two kinds of papayas are commonly grown. One has sweet, red or orange flesh, and the other has yellow flesh; in Australia, these are called "red papaya" and "yellow papaw", respectively. Either kind, picked green, is called a "green papaya". The large-fruited, red-fleshed 'Maradol', 'Sunrise', and 'Caribbean Red' papayas often sold in U.S. markets are commonly grown in Mexico and Belize. In 2011, Philippine researchers reported that by hybridizing papaya with Vasconcellea quercifolia, they had developed conventionally bred, nongenetically engineered papaya resistant to papaya ringspot virus (PRV). 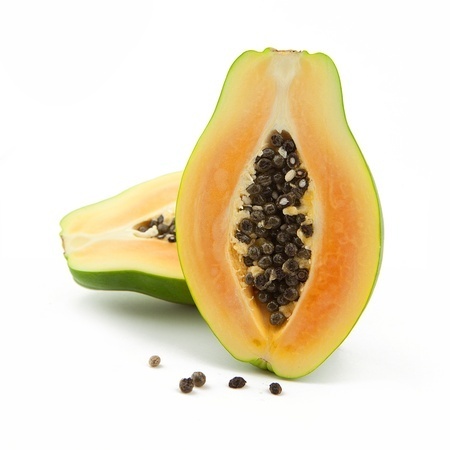 Carica papaya was the first transgenic fruit tree to have its genome sequenced. In response to the papaya ringspot virus outbreak in Hawaii, in 1998, genetically altered papaya were approved and brought to market (including 'SunUp' and 'Rainbow' varieties.) Varieties resistant to PRV have some DNA of this virus incorporated into the DNA of the plant. As of 2010, 80% of Hawaiian papaya plants were genetically modified. The modifications were made by University of Hawaii scientists, who made the modified seeds available to farmers without charge. Papaya ringspot virus is a well-known virus within plants in Florida. The first signs of the virus are yellowing and vein-clearing of younger leaves, as well as mottling yellow leaves. Infected leaves may obtain blisters, roughen or narrow, with blades sticking upwards from the middle of the leaves. The petioles and stems may develop dark green greasy streaks and in time become shorter. The ringspots are circular, C-shaped markings that are darker green than the fruit itself. In the later stages of the virus, the markings may become gray and crusty. Viral infections impact growth and reduce the fruit's quality. One of the biggest effects that viral infections have on papaya is the taste. As of 2010, the only way to protect papaya from this virus is genetic modification. The papaya mosaic virus destroys the plant until only a small tuft of leaves are left. The virus affects both the leaves of the plant and the fruit. Leaves show thin, irregular, dark-green lines around the borders and clear areas around the veins. The more severely affected leaves are irregular and linear in shape. The virus can infect the fruit at any stage of its maturity. Fruits as young as 2 weeks old have been spotted with dark-green ringspots about 1 inch in diameter. Rings on the fruit are most likely seen on either the stem end or the blossom end. In the early stages of the ringspots, the rings tend to be many closed circles, but as the disease develops, the rings will increase in diameter consisting of one large ring. The difference between the ringspot and the mosaic viruses is the ripe fruit in the ringspot has mottling of colors and mosaic does not. The fungus anthracnose is known to specifically attack papaya, especially the mature fruits. The disease starts out small with very few signs, such as water-soaked spots on ripening fruits. The spots become sunken, turn brown or black, and may get bigger. In some of the older spots, the fungus may produce pink spores. The fruit ends up being soft and having an off flavor because the fungus grows into the fruit. The fungus powdery mildew occurs as a superficial white presence on the surface of the leaf in which it is easily recognized. Tiny, light yellow spots begin on the lower surfaces of the leaf as the disease starts to make its way. The spots enlarge and white powdery growth appears on the leaves. The infection usually appears at the upper leaf surface as white fungal growth. Powdery mildew is not as severe as other diseases. The fungus phytophthora blight causes damping-off, root rot, stem rot, stem girdling, and fruit rot. Damping-off happens in young plants by wilting and death. The spots on established plants start out as white, water-soaked lesions at the fruit and branch scars. These spots enlarge and eventually cause death. The most dangerous feature of the disease is the infection of the fruit which may be toxic to consumers. The roots can also be severely and rapidly infected, causing the plant to brown and wilt away, collapsing within days. The papaya fruit fly lays its eggs inside of the fruit, possibly up to 100 or more eggs. The eggs usually hatch within 12 days when they begin to feed on seeds and interior parts of the fruit. When the larvae mature usually 16 days after being hatched, they eat their way out of the fruit, drop to the ground, and pupate in the soil to emerge within one to two weeks later as mature flies. The infected papaya will turn yellow and drop to the ground after infestation by the papaya fruit fly. The two-spotted spider mite is a 0.5-mm-long brown or orange-red or a green, greenish yellow translucent oval pest. They all have needle-like piercing-sucking mouthparts and feed by piercing the plant tissue with their mouthparts, usually on the underside of the plant. The spider mites spin fine threads of webbing on the host plant, and when they remove the sap, the mesophyll tissue collapses and a small chlorotic spot forms at the feeding sites. The leaves of the papaya fruit turn yellow, gray, or bronze. If the spider mites are not controlled, they can cause the death of the fruit. The papaya whitefly lays yellow, oval eggs that appear dusted on the undersides of the leaves. They eat papaya leaves, therefore damaging the fruit. There, the eggs developed into flies in three stages called instars. The first instar has well-developed legs and is the only mobile immature life stage. The crawlers insert their mouthparts in the lower surfaces of the leaf when they find it suitable and usually do not move again in this stage. The next instars are flattened, oval, and scale-like. In the final stage, the pupal whiteflies are more convex, with large, conspicuously red eyes. In 2016, global production of papayas was 13.05 million tonnes, led by India with 44% of the world total (table). Global papaya production grew significantly over the early 21st century, mainly as a result of increased production in India and demand by the United States. Raw papaya pulp contains 88% water, 11% carbohydrates, and negligible fat and protein (table). In a 100 gram amount, papaya fruit provides 43 kilocalories and is a significant source of vitamin C (75% of the Daily Value, DV) and a moderate source of folate (10% DV), but otherwise has low content of nutrients (see table). Green papaya is used in Southeast Asian cooking, both raw and cooked. In some parts of Asia, the young leaves of the papaya are steamed and eaten like spinach. Papayas became a part of Filipino cuisine after being introduced to the islands via the Manila galleons. Unripe or nearly ripe papayas (with orange flesh but still hard and green) are julienned and are commonly pickled into atchara which is ubiquitous as a side dish to salty dishes. Nearly ripe papayas can also be eaten fresh as ensaladang papaya (papaya salad) or cubed, and eaten dipped in vinegar or salt. Green papaya is also a common ingredient or filling in various savory dishes like okoy, tinola, ginataan, lumpia, and empanada, especially in the cuisines of northern Luzon. In Indonesian cuisine, the unripe green fruits and young leaves are boiled for use as part of lalab salad, while the flower buds are sautéed and stir-fried with chillies and green tomatoes as Minahasan papaya flower vegetable dish. In Thai cuisine, papaya is used to make Thai salads such as som tam and Thai curries such as kaeng som when still not fully ripe. In Brazil, the unripe fruits are often used to make sweets or preserves. Both green papaya fruit and the plant's latex are rich in papain, a protease used for tenderizing meat and other proteins, as practiced currently by indigenous Americans, people of the Caribbean region, and the Philippines. It is now included as a component in some powdered meat tenderizers. Papaya skin, pulp and seeds contain a variety of phytochemicals, including carotenoids and polyphenols, as well as benzyl isothiocyanates and benzyl glucosinates, with skin and pulp levels that increase during ripening. Papaya seeds also contain the cyanogenic substance prunasin. In some parts of the world, papaya leaves are made into tea as a treatment for malaria, but the mechanism is not understood and no treatment method based on these results has been scientifically proven. Papaya releases a latex fluid when not ripe, possibly causing irritation and an allergic reaction in some people.